Which full-season affiliate are you going to be following the most this season? 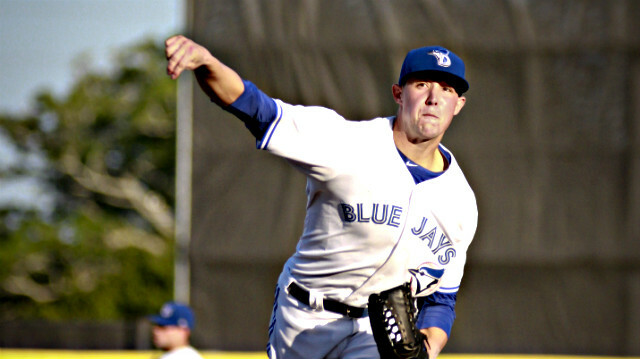 After blockbuster trades with the Marlins and Mets following the 2012 season vaulted Aaron Sanchez to the top of Blue Jays prospect lists, all eyes were on him as he kicked off his 2013 campaign in Florida. This second installment of our series looks at the adversity the California native was forced to deal with this past season. At the beginning of last season, it was so easy for people to envision in their minds. Aaron Sanchez, the long and lean top prospect with front-of-the-rotation stuff, would dominate the Advanced-A level much like he did the year before in the Midwest League and pitch under the lights in New Hampshire by season’s end. Instead, two unexpected injuries and bouts of inclement weather wreaked havoc on the right-hander’s pitching routine and limited him to just 86 1/3 regular season innings in Dunedin. First, discomfort up near Sanchez’s right collarbone halted his season in the middle of May. As the crown jewel of Toronto’s minor league system, he was shut down by the Blue Jays and wound up missing a month of action. “I think the shoulder issue wasn’t a big deal,” Sanchez told JaysProspects. “It was just shoulder tightness and I went out, I sat down and then I went out again and my velo dropped and it just felt like I didn’t have anything behind it. Adding insult to, well, injury was that not long after Sanchez came off the disabled list, his pitching pals from Lansing in 2012, Justin Nicolino and Noah Syndergaard, were both promoted to Double-A by their new organizations. Nicolino would go on to earn Florida State League Pitcher of the Year honors while Syndergaard wound up dominating the opposition at both levels he pitched at. Since Sanchez hadn’t pitched in over a month and was being handled with extreme care, he had to slowly work his way back after coming off the disabled list. After averaging close to five innings per start before hitting the DL, over a month went by following his return before he could pitch into the fifth inning again. “You get to the field and you can’t do anything but run, when you know you’re fine and you want to get going,” Sanchez said of his time on the disabled list. “Then when I came back off the DL, it was like hey, three innings, four innings, until I got stretched out. Then once I got stretched out, I missed a start for rain, or I got pushed back a start because I hadn’t pitched in six or seven days. After finally logging a five-inning outing since returning from the DL, Sanchez’s very next start on July 28 was his worst of the season. Unable to make it out of the first inning, he retired only two batters and was tagged with five earned runs on two hits with four walks. When the news of the early exit broke on Twitter, an uneasiness emerged from some Blue Jays fans and comparisons to Nicolino and Syndergaard reared their ugly heads again. The thing that no one knew, though, is that Sanchez had been given something specific to work on in that game, regardless of the result. Two starts later, there was more cause for concern when Sanchez recorded his shortest outing of the season on August 7. Facing just his third batter of the game after issuing a leadoff walk and getting a ground out, the California native called for a trainer and walked off the field. After his sinker had reportedly caused inflammation in his fingers, Sanchez wound up developing a blister on his throwing hand. Once again, he downplayed the incident. As if the shoulder issue and blister weren’t enough, Sanchez ran into some unexpected trouble with the elements near the tail end of the season, which messed up his routine even further. 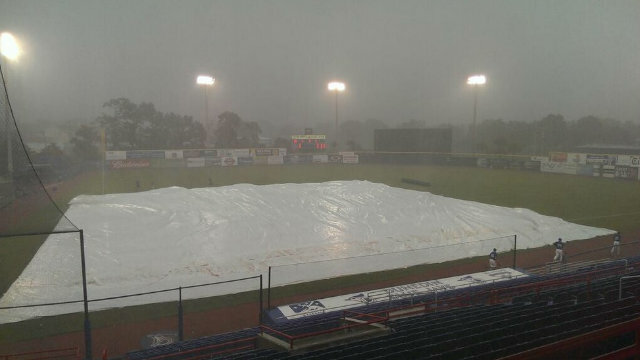 Trouble with the elements at Florida Auto Exchange Stadium in Dunedin. Slated to start August 20 against Daytona, Sanchez was pushed back a day after a torrential downpour hit the Gulf Coast and the game was postponed. Then the following day, he was scheduled to follow rehabbing Blue Jays reliever Luis Perez only to have that game cancelled as well. When a third consecutive game—which Sanchez was ready to pitch in—was rained out after that, the right-hander wound up getting pushed back two more days to the 24th. On 10 days rest and after a 35-minute rain delay, Sanchez finally began his scheduled start on that stormy night of August 24. It was not worth the wait, however, as it was one of his worst outings of the season. After breezing through the first two innings, a pivotal at-bat started off the third inning. Facing Manatees center fielder D’Vontrey Richardson first, Sanchez clawed his way back to a full count after falling behind early. Two foul balls and a high, 94-mile-per-hour fastball later, and Richardson was aboard with a leadoff walk. After a well-executed hit and run put runners on the corners, a surefire double play ball went under the glove of Dunedin third baseman Gustavo Pierre and prolonged what became a six-run inning. Sanchez departed the game charged with six runs (three earned) on five hits in 2 2/3 innings, with three strikeouts and tying a season high with four walks. All in all, the top prospect has taken all of the adversity he endured last season in stride and certainly learned from the experiences. “I think it makes you mentally stronger, I think for me it did,” Sanchez said. “Obviously wanting to be out there competing with your teammates, and they have your back every fifth day and you want to have their back every fifth day. It’s tough, you just feel like you’re a lost cause because you can’t really do anything. Jared is the editor-in-chief of JaysProspects. A credentialed media member with each affiliate in Toronto's minor league system, he has seen nearly every Blue Jays prospect in person, using information from coaches, scouts, and players to add to his content on the site. His work has been featured in the Toronto Star and on MLB Trade Rumors, among others.